Artificial Intelligence companies around the world are working hard to make things easy for us. The things we saw in old Hollywood movies are becoming real day by day. Especially, the use of robots in the sectors like Health and Technology is developing very quickly. China is leading the way in AI robots research and development. Recently, the General Hospital of the People’s Liberation Army in Beijing has hired two AI robots named Xiaoman. These robots are developed by a well-known AI company called iFlytek in China. iFlytek is a famous company just like Google, Amazon and Microsoft in the global voice recognition market. Besides voice recognition, it also develops robots related to medical care. Other than smart hospital –guide robots, it also has robot that can record the dialogues between patients and doctors. It can generate the medical history, saving doctors a lot of time and effort. The main aim of robot is to take-off Hospital’s HR burden. According to the Xiaoman developers, a person helping in a hospital can answer maximum of 600 questions per day. However, Xiaoman can answer 2000 question per day with more accuracy, serving around 600 patients per day. This will really ease the workload from the hospital staff. At the moment, you can just meet in the Xiaoman at the General Hospital in Beijing, China. 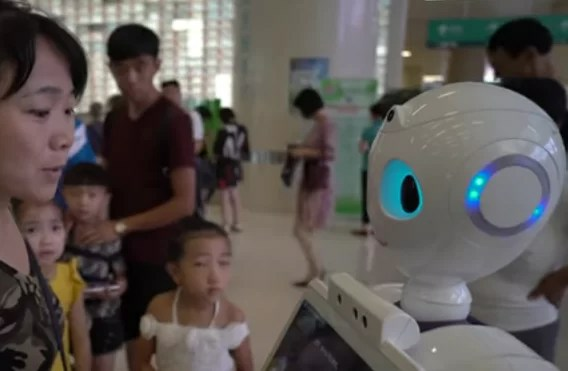 Soon, 50 hospitals around China are going to use this AI robot to welcome patients and visitors. Guangzhou Second Provincial Central Hospital in China has adopted something more advanced than Xiaoman. This Hospital has incorporated AI in nearly every major activity like CT-Scan, Pre-diagnosis, and transporting supplies. The implementation of AI will definitely overcome the shortage of doctors in Chinese hospitals. By the use of WeChat, an application owned by Tencent, a famous tech company in China, patients can get the pre-diagnostic reports after responding to few question asked by an “Intelligent Doctor”. According to the hospital authorities, the accuracy level of the AI program to detect medical problems is more than 90%. Guangzhou Second Provincial Central Hospital also uses facial recognition to create a profile for new patients. As AI robots continue to rule hospitals in China, there are still challenges to overcome. If the robot makes a wrong decision, then who will be responsible for it? Moreover, the robot still needs signature of a real doctor to approve medical reports.